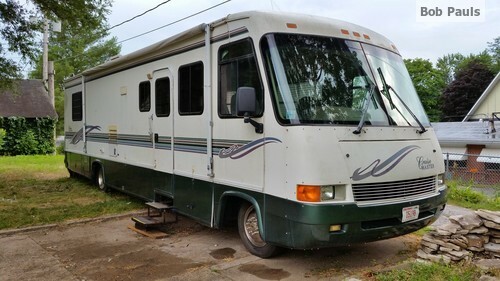 An interesting aspect of travel is that once you’ve stayed in either a building or an area long enough it starts to feel like home.You get used to the environment.People traveling in recreational vehicles get accustomed to getting up from the front passenger seat and heading back to the refrigerator to get a cold drink or use the bathroom. A small problem exists though when you get up from the driver’s seat to do the same while the vehicle is in motion. You have to remember that salient difference. Believe it or not, I've caught myself while driving getting the notion to jump up and go get a soda. Lets see, IF I'm really fast... Nah. Other local residents of Moffat County (extreme NW Colorado) are accustomed to doing daring deeds too. 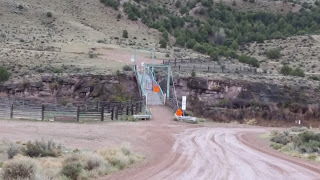 Every day local ranchers make use of the local “swinging bridge.” They are accustomed to its risks and rewards. Let’s also admit that this bridge in Brown’s Park National Wildlife Refuge has seen its better days, but continues to be needed for moving livestock to greener pastures or taking the gravel road shortcut to the biggest town around here, Vernal, Utah. This suspension bridge is almost exactly the width of a tractor or a medium size car. Just a few inches to spare. No passing allowed. The bridge supports the weight of one typical older car: 3 tons. 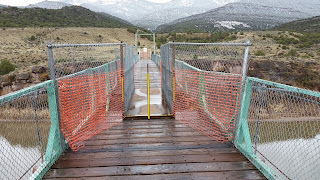 Flanked on both sides by loosely bound 2"x4” wood frames held together by irregular sections of chain-link fencing, this barrier keeps sheep, cattle, and little children from falling into the river. Not much else. The roadbed consists of thin, aged wooden planks laid on a few thick wooden beams that then rest on steel crossbars. The gap between the planks is large enough to stick your hand through. Admittedly, wooden bridges without roofs do a) tend to deteriorate faster and b) not support quite the same heavy loads that modern steel and concrete structures can. 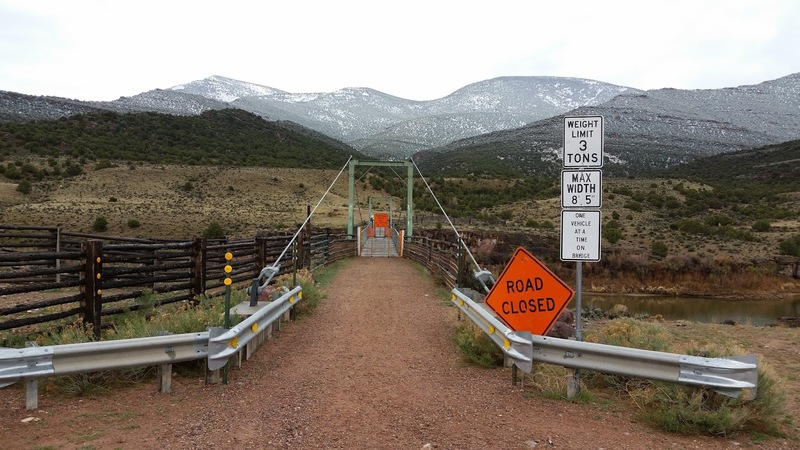 That doesn't stop the brave locals from getting used to driving all sorts of vehicles across the swinging bridge. Case in point: earlier this year a ranch hand decided to drive a large, heavy, four wheel drive tractor with a BIG, wide front loader bucket across the bridge. Sure the tractor weighed more than the bridge design allowed, but the day’s work must get done before sundown. Create your own mental picture of the scene. The driver is slowly squeezing across the bridge when at about the halfway point the heavily loaded front wheels suddenly crash through the floor and the driver sitting above the rear axle starts to follow. Of course, this is when you realize that if it weren't for that big, heavy bucket this probably wouldn't have happened, but it’s too late. But, suddenly everything stops moving. You see, if it weren't for that same wide bucket the entire tractor would be resting in the icy waters of the Green River. The bucket caught the tractor front end after it fell several feet thus likely scared the bejeezus out of one lucky tractor jockey. That very same bucket also proved useful in rescuing the tractor by using its hydraulics to raise the front end up high enough to slide temporary steel beams under the tires across the shattered void. The tractor was thus able to be driven gingerly across the bridge to safe harbor. The swinging bridge remains out of commission today while the government and the rancher’s insurance company work out a settlement. In the meantime, you too can try your luck crossing this swinging bridge on a temporary, pedestrian gang plank that spans the void. I used it. It’s not hard to do once you get the swing of it.